Mikro Desktop is a small loudspeaker that employs a Wavecor full range loudspeaker FR070WA04. Mikro Desktop has been developed by Bernd Timmermanns. Mikro Desktop is a compact speaker with closed cabinet. Below 160 Hz it should be enhanced by a subwoofer. The crossover consists of a LRC notch filter wired in series. Also in series a capacitor is employed. In parallel to the full range driver a RL circuit is arranged. 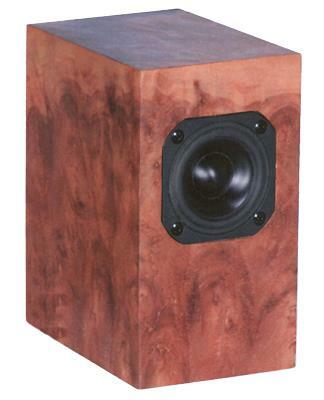 Between 50 Hz and 17 kHz, the frequency response of this loudspeaker is nearly flat on axis together with a subwoofer. The decay spectrum is nearly perfect below 17 kHz. At low volume, i.e. 80 dB at 1 m, the nonlinear distortions are below 0.1% above 600 Hz. Below 160 Hz Mikro Desktop should be supported by a subwoofer.